This posting excerpts Robbins Barstow’s liner notes for The Abbakadabba Coopno. New York University received a grant from the National Film Preservation Foundation (NFPF) to preserve a 17-minute film by NYU alumnus Robbins Barstow. Barstow, an educator and amateur filmmaker whose 1956 Disneyland Dream was named to the National Film Registry, donated four films to the New York University Archives in 2008. One of them, The Abbakadabba Coopno, has been selected for preservation by the NFPF. 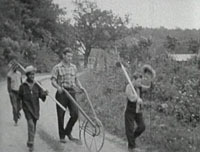 Barstow’s 1941 film depicts the Abbakadabba Farm in Port Murray, New Jersey. A group of Christian pacifists, who had registered as conscientious objectors under the 1940 Selective Service Act prior to the U.S. entering World War II in December 1941, operated the farm. 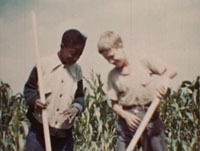 The farm was established to provide summer recreation for a group of young kids from low-income neighborhoods in Newark, New Jersey. The film was conceived of, directed, shot, edited, and hand-titled by Barstow. A staff volunteer, Barstow had recently graduated from Dartmouth College (class of 1941) when he accepted work on the farm with his wife, Meg. The “Newark Kid-Stars,” as they are credited in the film, helped to create the story and acted in the film, yet their names were never recorded. The funding from the NFPF will provide film-to-film preservation as well as copies for patron access.